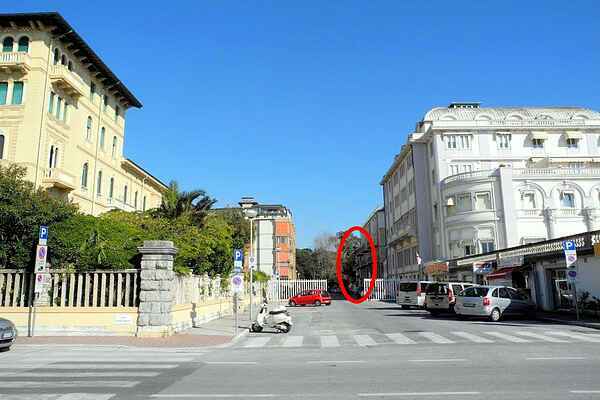 Comfortable holiday apartment located in the center of Viareggio, a few meters from the beach and the promenade. This accommodation is situated on the first floor of an building (no elevator). The rooms are spacious and bright. From the balcony you can see the beach, the sea and the fresh pine forest. The beach is within walking distance; many shops, restaurants and other facilities are nearby. Ideal not only in summer but also in the carnival holiday, with the famous and traditional carnival parade. This apartment is located in a parking area for a fee. We recommend to do a weekly subscription. Outlets subscription stop: Office Mover Via Regia from Monday to Friday from 8.45 to 12.45; VAIBUS bus from Monday to Saturday from 9.30 to 13 and from 15.30 to 19.30; Tobacconist Grazioli Piazza Mazzini every day from 8.30 to 20; Newsstand PP 29 Via Buonarroti ang. Via Vespucci every day from 7.30 to 20. This apartment is located in a paid parking area. We recommend that you take a weekly pass. Stations for season tickets: Mover Office Via Regia from Monday to Friday from 8.45am to 12.45am; Vaibus buses from Monday to Saturday from 9.30 to 13 and from 15.30 to 19.30; Tabaccheria Grazioli Piazza Mazzini every day from 8.30 to 20; Newsstand PP 29 Via Buonarroti ang. Via Vespucci every day from 7.30 to 20. Viareggio offers holidays full of leisure and relaxation. Long beaches, immense pine forests, sea and culture. A place suitable for every season included in that holiday land called Versilia. There is the Viareggio of the tourism and that of the nautical one that represents the new productive and tourist frontier of the city; that of folklore with its famous Carnival (www.viareggio.ilcarnevale.com); that of music with its international Puccini festival (www.puccinifestival.it) in the impressive theater suspended on the waters of the lagoon Massaciuccoli in Torre del Lago Puccini and that of flowers and crafts. In Viareggio, a Blue Flag waving, clean sea and good quality tourist services; since 1977 Viareggio receives the FEE acknowledgment for the good quality of the environment, water and bathing services. In addition to the beautiful coast Viareggio offers two immense pine forests, a large green lung with bicycle rental services, refreshment areas and games. A few miles away is the Parco delle Apuane (north) and the one of Migliarino San Rossore Massaciuccoli (south) for birdwatching, climbing and general enthusiasts. The Promenade is a splendid showcase of the most beautiful Art Nouveau architecture of the city, a combination of artistic space and shopping center with prestigious boutiques; in the central pedestrian area shops and outdoor cafes. Great restaurants included in the most qualified gastronomic guides offer the typical cuisine of Viareggio based mainly on seafood specialties. And many other wonders to discover ! !